Sadly, due to the inclement weather, we have decided to cancel tonight's Project Venture family night. Stay tuned and look for online registration forms by tomorrow or Monday. We are hoping to reschedule Project Venture family night early spring and collaborate with other tribal Department's when the weather is more cooperative. I'm so sorry for families who were looking forward to this event. If you have any questions or concerns about registering your child for Project Venture please email me and I can send you forms through email. We are working on getting online registration up and available for All Families. Thank you for your continued patience and understanding. We are looking forward to all students enrolling in Project Venture tribal youth program! 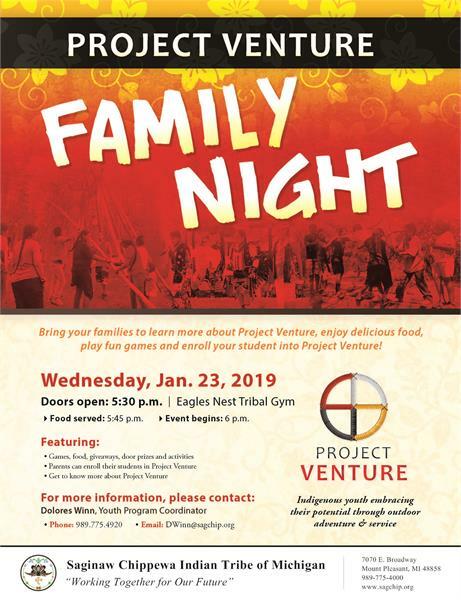 We have rescheduled PROJECT VENTURE FAMILY NIGHT event for next Monday, January 28th at the Eagles Nest Tribal Gym. Bring your families to learn more about Project Venture, enjoy delicious food, play fun games and enroll your student into Project Venture!